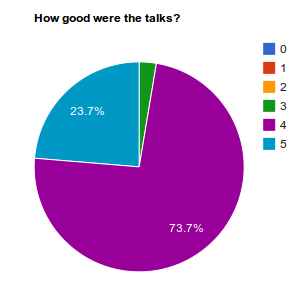 We also got a lot of excellent feedback about our speakers - so thanks again to these guys for helping us get some actual content for the attendees! 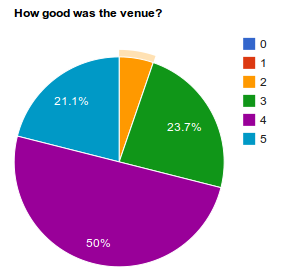 When it comes to the venue, we scored a little lower, with more 3s entering the mix. We needed to give our speakers microphones and a soundsystem. The reason we didn't was that we didn't expect to actually fill the room quite so full, and the hotel recommended in that case we shouldn't need it. And we didn't re-evaluate that requirement once we had sold out. Clearly something we can improve the next year. Conference room "too deep" and not sloped led to some slides hard to see. This is also a fallout from us being more people than we initially expected, unfortunately. Lack of power by the seats to recharge laptops, tablets, phones and other gadgets. A few people comments on the airflow not keeping up in the afternoon. 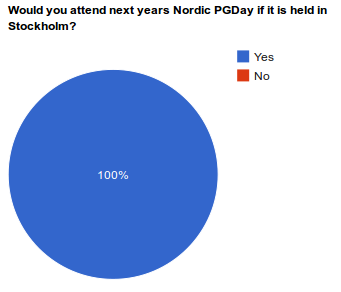 It's not surprising that Stockholm came out at the top. 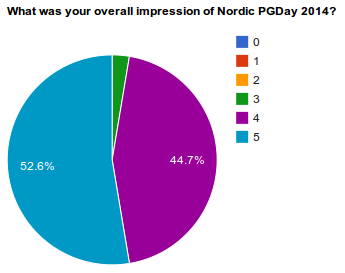 The other numbers are probably at least partially influenced by a larger group of people from the Baltics and from that Helsinki is closer to Stockholm. 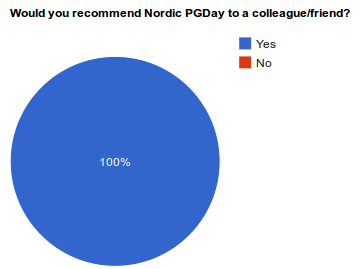 When it comes to the size of the conference, we seem to be where people want to be - 63% preferred a one-day conference over a longer one, and 68% preferred a one-track conference over two. 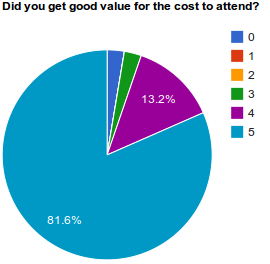 We're happy to note that most attendees found that they got good value for money at the conference, and when asking about next year it's clear that most of our attendees would be ok with a small increase in the cost, if necessary. Our goal is of course not to do this unless we have to, but it always comes down to the sponsorship levels. In fact, a lot of things come down to our sponsors, so we definitely have to thank them again! 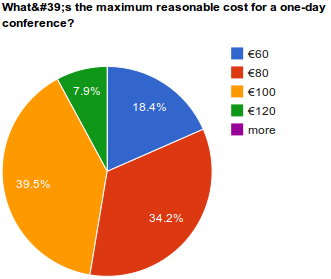 This leaves a sum of €512 positive so far, to cover any additional expenses that might show up after the event. I'd also like to extend an extra thank you to those speakers who offered to "give up" parts of their speaker sponsorship package if our finances wouldn't be enough to cover it. It turns out we didn't need to use that, but having the ability to do so definitely helped with our planning!